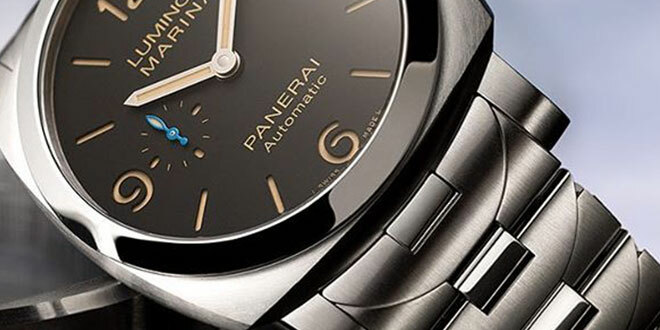 It’s been a very long time since Officine Panerai has released a regular production model that features their iconic stainless steel bracelet. 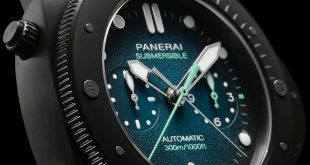 The wait is now over with the mid season release of the PAM722 and PAM723 Luminor Marina 1950. 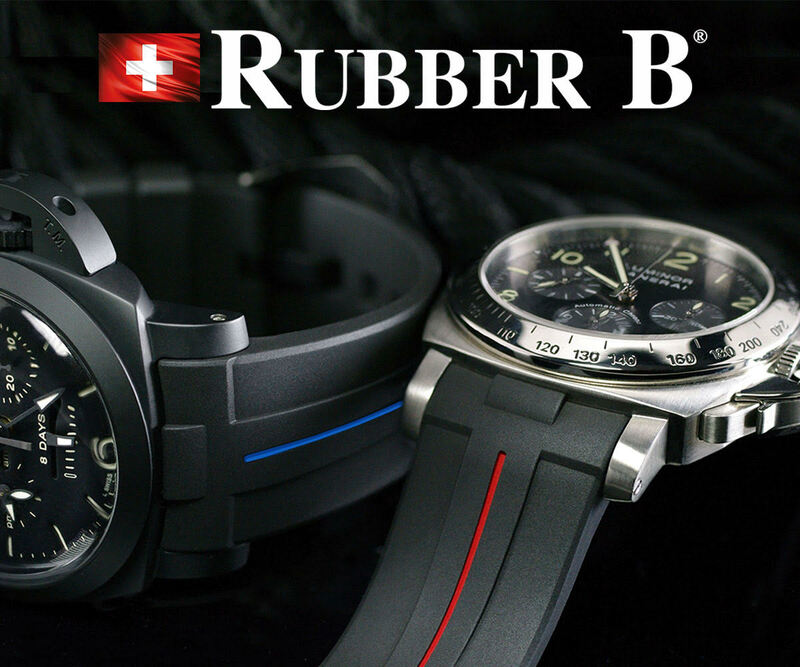 There are two models that have been released which utilize the stainless steel bracelet, the PAM722 is the 42mm version while the PAM723 is the 44mm version. 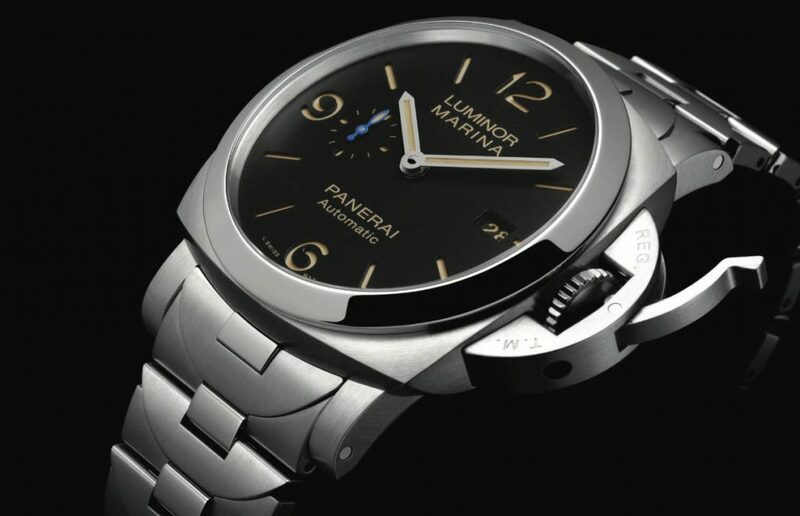 These Luminor Marina models are exactly like the PAM1312 and PAM1392 which replaced the iconic PAM312 and PAM1392. 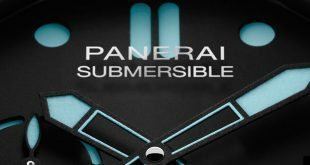 The new versions of the watch feature a new thinner 1950’s case, the word automatic on the dial, a vintage faux lume, and a blue sub second hand. 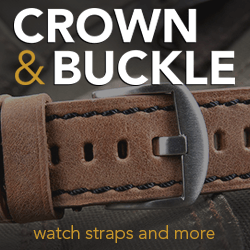 Of course the biggest change with these is the stainless steel bracelet which celebrates the iconic crown guard in it’s design. You can distinctly see the curved semi circle crown guard shape in each of the individual links that create this beautiful bracelet. The newest version of the bracelet wich is made of 316L stainless steel has changed a bit from the earlier versions as well. The have eliminated the screws on the back that held the links together and is also thinner to match the slimmer watch case. Each link of the stainless steel bracelet is actually three pieces that are held together by a single lateral screw. 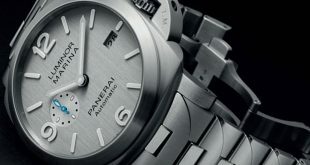 Both models like the versions that come on a regular strap, are powered by the new Panerai P.9010 in house automatic movement. 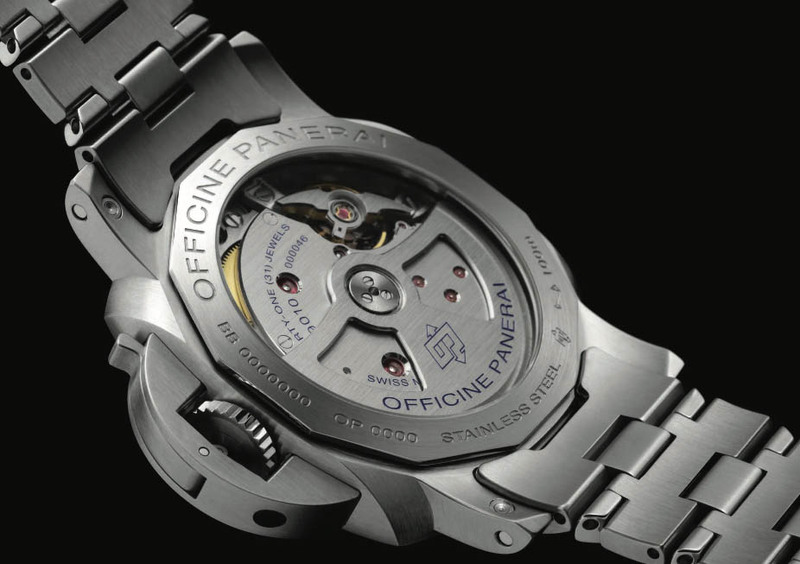 This movement which is an updated and thinner version of the P.9000 movement features a 72 hour power reserve, 31 Jewels, and 200 components. The movement is housed beautifully for display with a clear case back. 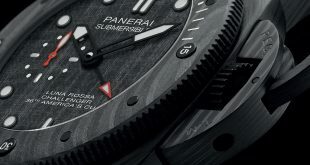 The PAM722 is water resistant up to 100 meters while the PAM723 has a resistance of up to 300 meters. It’s not a common thing to see a Panerai on a bracelet, but there are a lot of fans of this combination. 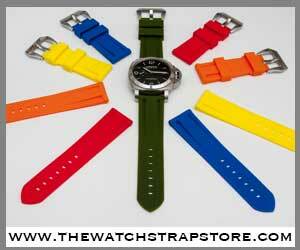 Don’t worry if you are like me and love to change the straps to match your daily outfit. The Panerai PAM722 and PAM723 both feature the very convenient quick strap change system so you can get any look you want on the watch. Pricing has not been announced yet for these pieces but I am guessing they will be about 1k more than than the PAM1312 and PAM1392 to make up for the cost of the bracelet. Beautiful watch. I have 1312, can I buy this bracelet separate? Yes, you can buy it at the boutiques.